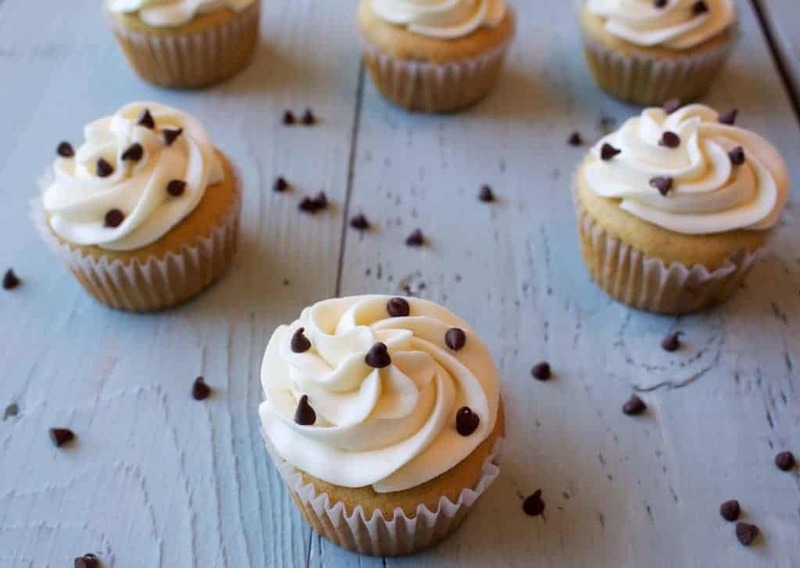 Chocolate chip cookie dough cupcakes make any potluck or foodie event better. 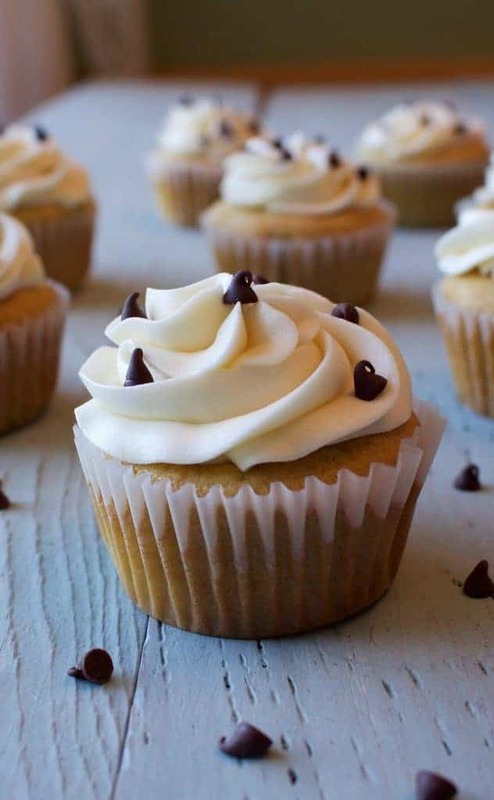 This lovely vanilla cupcake recipe is filled with an eggless cookie dough. This gourmet cupcake recipe is a perfect party table dessert. 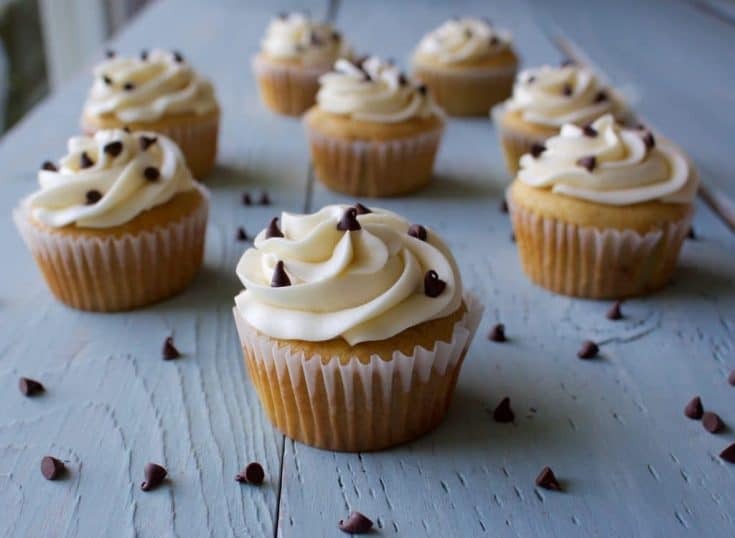 Chocolate chip cookie dough cupcakes with soft eggless cookie dough baked into the center of a vanilla cupcake and topped with vanilla buttercream frosting. Our eggless cookie dough recipe keeps you safe from salmonella. Wouldn’t want to take the chance you know? We topped off the beautifully textured vanilla cake with a light and fluffy buttercream frosting. Sprinkle a few mini chocolate chips on top and viola!…A lovely chocolate chip cupcake recipe. Our vanilla cupcake recipe DOES contain eggs. ONLY the cookie dough is eggless. For an ENTIRELY eggless cupcake recipe you will need to use an egg substitute in the vanilla cupcake recipe. Who doesn’t love eating raw cookie dough? You can even buy it in tubs now. Many companies make a wonderful business off America’s obsession with raw cookie dough. Cupcakes with cookie dough are marvelous too. Your family is going to love this cupcake recipe from scratch. It’s a process…but so worth it! Watch the video below to see the frosting technique I used on these cupcakes. It’s so easy and pretty. I use this decorating method on LOT of my cupcakes. And WAIT till you try this cupcake frosting recipe. It’s perfect for this gourmet cupcake recipe. Yeah I’m going there. And you will be happy you did too! This is an easy filled cupcake recipe. However, it does require some time. So PLAN AHEAD with this one. This recipe features a vanilla cupcake with a ball of frozen cookie dough baked into the center of the cupcake. The cookie dough is nice and soft in the center so it tastes marvelous in the vanilla cake. You definitely want to make sure the cookie dough balls are frozen solid before you bake them into the batter. I froze mine about 12 hours. Making the cookie dough the night before breaks up the work quite a bit! These cupcakes are simple to make. 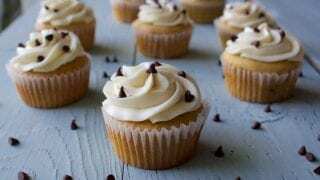 Just a basic vanilla cupcake filled with easy to make eggless cookie dough. Top them with super simple vanilla buttercream frosting. 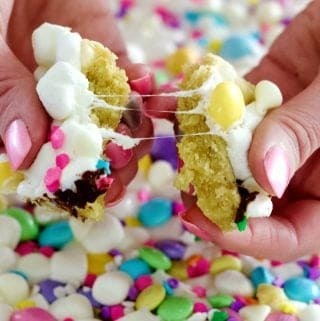 Add a few randomly sprinkled on mini chocolate chips and you are there. These cupcakes make a lovely party dessert for a grown up birthday or special event. Kids love them too so this dessert recipe is great for a multi age event. 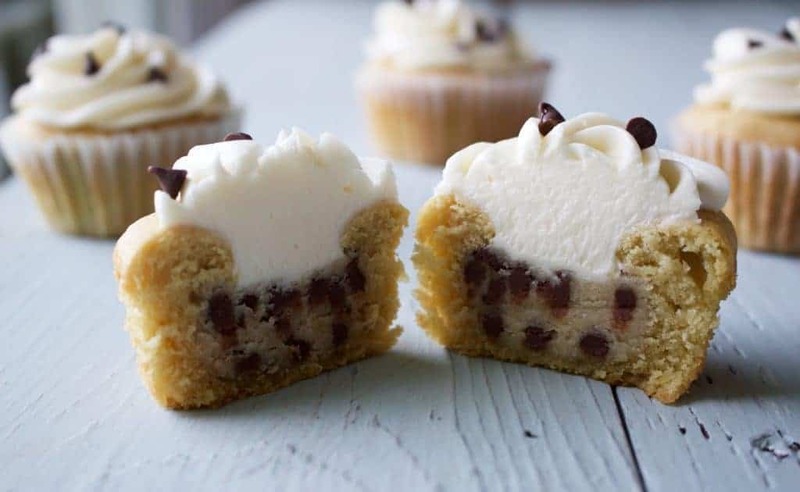 cookie dough cupcakes are great all year round! Looking for more Creative Filled Cupcake ideas? Head over to cupcake corner. We have many yummy cupcakes for you to try. This is only cupcake FILLED with cookie dough. The Cookies and Cream cupcake uses Oreo crumbs and Candy Cream Bars. Another cupcake idea you may enjoy. 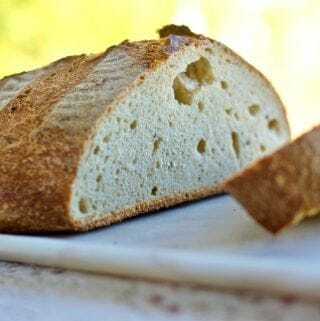 Beat the butter alone until it is pale in color, light and fluffy. Add in the powdered sugar slowly beating until it is thoroughly mixed in. Add the vanilla and the milk next, start with 3 tbsp of milk and test the consistency. I ended up using 4 tbsp of milk. I decorated the cupcakes with the swirl technique. I used a Wilton 2D tip and mini chocolate chips on top. I demonstrate it for you in a video in this post. Chocolate chip cookie dough cupcakes with soft eggless cookie dough baked into the center of a vanilla cupcake and topped with vanilla buttercream frosting. So yummy! Beat together butter and sugars in a large mixing bowl. Beat until it is smooth and creamy. Next, beat in vanilla and milk until smooth. Add the flour and salt and beat until just combined. Roll the dough into 1-1 1/2 balls and place on ungreased cookie sheet. Make 24 round balls, and cover with plastic wrap on cookie sheet. Freeze for 12-24 hours or until frozen solid. Combine the butter and brown sugar, beat until it is light and fluffy. Mix in the eggs one at a time. Make sure you scrape the bowl down between additions. Combine the flour, salt, baking soda, and baking powder in a medium bowl. Alternate adding the dry ingredients to the batter with the milk. Make sure they are completely mixed in. Finally, blend in the vanilla. Fill the cupcake liners 1/2 full. Place a frozen ball of cookie dough into each cupcake liner after you have added the batter. The cookie dough will stick out above the batter and that's okay. Bake for 16-18 minutes or until the batter is light brown around the edge of the cookie dough ball. 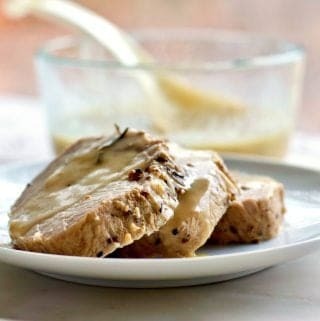 Beat the butter alone for 2 to 4 minutes until it is pale, light and fluffy. Add the vanilla and the milk next, start with 2 Tablespoons of milk and test the consistency. I ended up using 4 tbsp of milk. I decorated the cupcakes with a Wilton 2D tip and set mini chocolate chips on top. 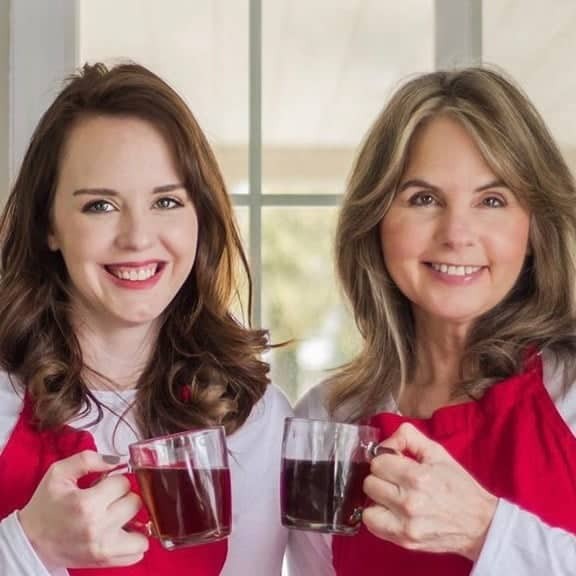 Watch the video for helps on the swirl technique. Plan this recipe ahead to make it easy on you. Make the cookie dough a day ahead and freeze the cookie dough balls. Can you use a box mix for the cupcakes and it will bake just as well? Hi Sarah, I haven’t used a cake mix in a really long time. So my answer here is “Probably.” If you have a favorite vanilla cake mix give it a try. The odds are good it will turn out fine. 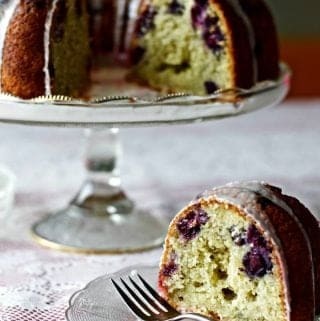 Please let us know if you have success with a cake mix in this recipe. I’m sure our other readers will want to know. Best of luck and have a great day! I’m new to the baking scene and I was planning the easy way out for my son’s “un”Birthday at school(he was born in August). Then I came upon this recipe and thought, let’s make it fun. Thank you for sharing your ideas and showing us newbies how easy everything from scratch can be. I will let everyone know how the boxed mix fairs. Wonderful! Happy Birthday Party for your son. I’m excited to hear how these work out for you! Box mix turned out fine. I will definitely try the full recipe next time. Hi Sarah, Thanks so much for letting us know. Enjoy! Thank you! They are so good! Thanks for stopping by! Seriously cookie dough anything is an instant hit in my books.. totally craving all of these cupcakes deliciousness right now! These look absolutely delicious! Pinned and shared! Thank you Joanne. Kayti does a wonderful job on her cupcakes!